Thermo Scientific Teorema Can Checkweigher has no moving parts—design provides unparalleled speed and accuracy for today's demanding high rate canning lines. Thermo Scientific offers a complete line of can checkweighing equipment for efficient product inspection to protect your brand and ensure safety and quality to customers. The Thermo Scientific Teorema can checkweigher provides the new standard in high-rate can weighing by combining rugged capability with accuracy. Standard Teorema is configured as a turnkey package. 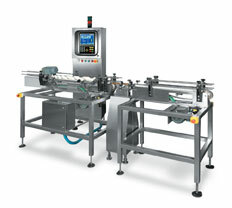 No moving parts weigh-section (no chains or belts) for high accuracy and minimum maintenance requirement. Complete systems with the highest levels of safety guarding and interlock included in a single turnkey proposal. Compliance: This solution meets the accuracy requirements of OIML R-51 and the USA Handbook-44 at line speeds up to 660 cans per minute.